The first baseball game that Shinichiro Saito witnessed live at a stadium as part of a whimsical project dragged on for so long that it had to be completed the following day. Saito was hooked on the experience well before the last out. Since that game 27 years ago, he has seen about 4,000 baseball games at all levels and visited 877 stadiums from the northern tip of Hokkaido to an island southwest of the main Okinawa island. In March, Saito, 52, published a book about his journey. It contains not only photos of all the ballparks Saito visited around the nation but also the final score of every game he watched. Saito began his long quest when he was 25 and working as a scriptwriter for a popular daily TV program that provided a wrap-up of the day’s results in Nippon Professional Baseball. To find material for the show, Saito often visited the National Diet Library, which kept on hand all newspapers published in Japan. At that time, Saito felt that he might be able to visit all ballparks in Japan if he began right away. Saito was born in Ibaraki Prefecture, but he became a fan of the Osaka-based Nankai Hawks after reading the “Abusan” manga series that was based on that team. The franchise has since moved to Fukuoka and is now known as the Softbank Hawks. The marathon game that Saito watched a quarter of a century ago was the final for the spring season involving high school teams from the Kanto region. Played in Tsuchiura, Ibaraki Prefecture, the game used a softer rubber ball instead of the normal cowhide baseball. The two teams battled to a tie after 18 innings. Excited by what he saw, Saito stayed overnight in Tsuchiura to watch the completion of the game the next day. His long journey had begun. He implemented two rules. One was to take a photo of every ballpark to provide documented evidence. The other was to keep score of the game he watched. He continued to visit the National Diet Library to read local newspapers and find out where baseball tournaments were being held. On occasion, he went straight to a ballpark after pulling an all-nighter at work. To stave off sleep during games, he stabbed his thigh with a pen. He often travels by himself. To cut down on costs, Saito goes directly to the ballpark without stopping at tourist sites or eating local delicacies. He said his greatest joy is reviewing the scorecard on the return train trip while gulping down a can of beer. In January, Saito was on Miyakojima island in Okinawa Prefecture for the final between rival junior high school teams. Outside of parents of the teams’ ballplayers, Saito was the only spectator at the game. “I became deeply moved when I thought that here, in the southernmost part of Japan, there was such a high level of baseball being played,” Saito said. 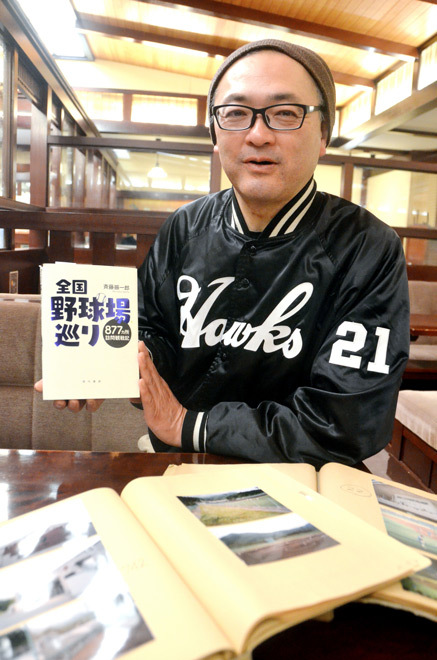 Saito’s book, “Zenkoku Yakyujo Meguri” (Journey to ballparks around Japan), published by Tokyo-based Gendai Shokan, is an epic matching his long journey. The 638-page volume holds photos of all 877 ballparks as well as short comments about each venue. One in Nakano, Nagano Prefecture, is arguably the largest ballpark in Japan because center field is 137.7 meters from home plate. One ballpark in Fuji-Yoshida, Yamanashi Prefecture, has a great view of Mount Fuji beyond the outfield. Saito has also witnessed the changing times. His childhood favorite Nankai Hawks played in a stadium located close to a major train station in central Osaka. What is now known as the Chiba Lotte Marines once played near Kawasaki Station in Kanagawa Prefecture. Those two stadiums have long been demolished. Most of the newer ballparks are located on the outskirts of major cities, meaning a car is needed to get to those stadiums. The publication of his book does not mean Saito has visited all ballparks in Japan. He believes there are at least 100 more to go. Moreover, new ballparks are always being built.